China is hands-down the manufacturing Mecca for a PC hardware nerd like me. So when I had the opportunity to see the magic happening first-hand I immediately packed a bag and travelled the 6,000-odd miles from the Shire-like West of England to the smog-choked Mordor of Dongguan in China to see just how such technical wonders are created. Like many PC gamers I automatically expect my expensive, complex lump of graphics processing goodness to just work, giving practically zero thought to where it’s come from or how it got here. But when I was given the chance to see first-hand the latest batch of Nvidia and AMD graphics cards being created and tested before my jet-lagged eyeballs I immediately jumped at it. And yeah, I now have a new appreciation for both the engineers who solder, screw, and test every single card as well as the marvellous machines that help them do it. Seriously, those little robotic component-placing magicians are mesmerising. I could watch them all day… which might make me more suited to factory work in China than I might have initially expected. 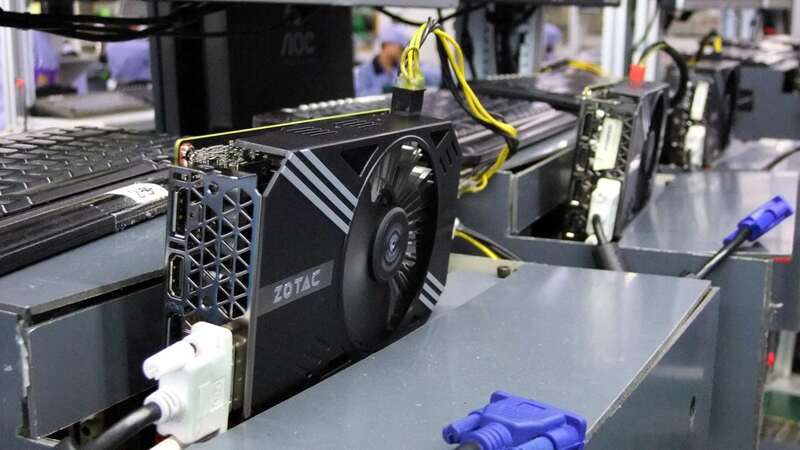 There are numerous manufacturers selling graphics cards for your gaming pleasure, but probably fewer companies actually putting the cards together than you might think from browsing Amazon. I was lucky enough to visit one of the manufacturing facilities of a company you’ve probably never heard of, but have in all likelihood used something it’s created. PC Partner has been making technology happen since 1997 when it began life as a motherboard supplier. The following year it started its contract manufacturing business and has never looked back. 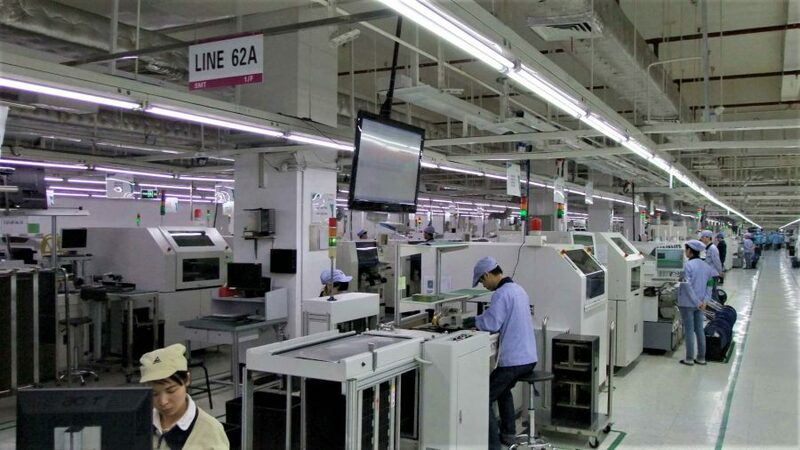 Today it manufactures products for a wide range of companies, such as Dell, AMD, Acer, Samsung, Sapphire, LG, Microsoft, as well as its own brands: Zotac and Inno3D. And in graphics card terms that means it manufactures both Nvidia and AMD cards – dig deep enough and tribal roots often sprout from the same place. PC Partner is, in fact, the largest contract manufacturer of AMD cards. 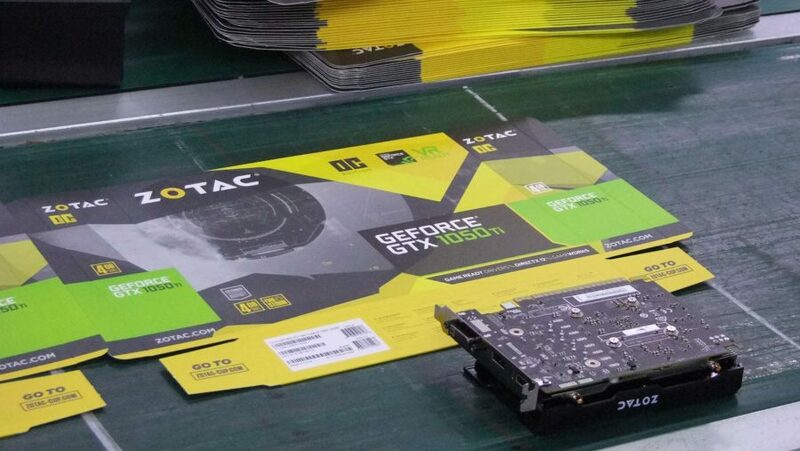 Though I wasn’t allowed to photograph the AMD graphics cards coming off the production line so you’ll only see Nvidia-based Zotac cards. As well as graphics cards PC Partner also manufactures motherboards, mini PCs, flash media products, ATMs and point of sale devices. And the numbers are pretty staggering too – PC Partner alone will produce 400,000 graphics cards each month and, when you see the process each and every one of those has to go through before it reaches our PCs, that number becomes even more impressive. Each of PC Partner’s graphics card production lines can create, on average, around 4,000 units per day. But each line is not limited to one single product – while it tries to limit line changes to less than five times a day it is not unheard of for production to be switched around that much, especially during times of high-demand. So highly streamlined is the process that for similar cards it can take as little as five minutes to switch from one to another, and if it’s changing from a small card to a larger one that may still only take a maximum of 15 minutes. That’s an astoundingly quick turnaround in the manufacturing process from making one completely different card to another. Though time is money, so it all adds up. 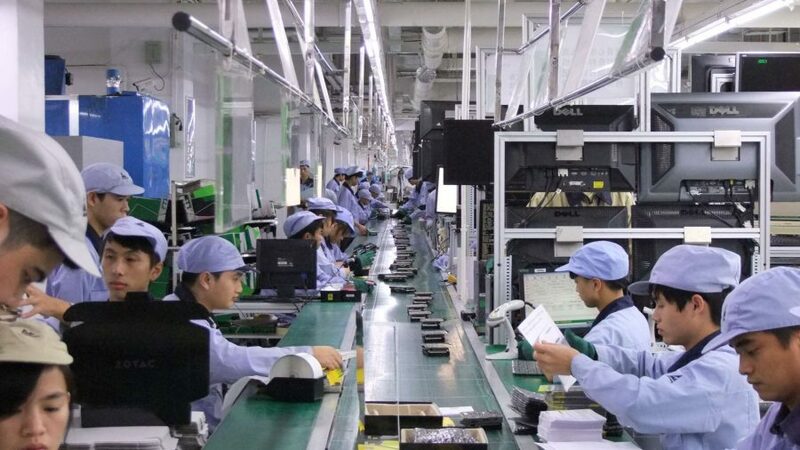 The Dongguan factory floor is a tightly regimented space where the only noise is the constant grinds, whirs and piston-sighs of the manufacturing equipment. There is not a single human noise to be heard from the many staff populating each of the different production lines on any floor of the large, grey building. Whether that’s a product of the pressured environment where orders have to be fulfilled and failure is not an option, or purely because there’s a bunch of ignorant journalists wandering around – so try to ignore them – I’m not entirely sure. But production is tightly controlled with every aspect of the manufacturing process keenly observed by myriad automated systems feeding into a single monitoring hub. Here every dip in production, every error in manufacturing, can be seen and pinpointed and compared with previous days, weeks or months. 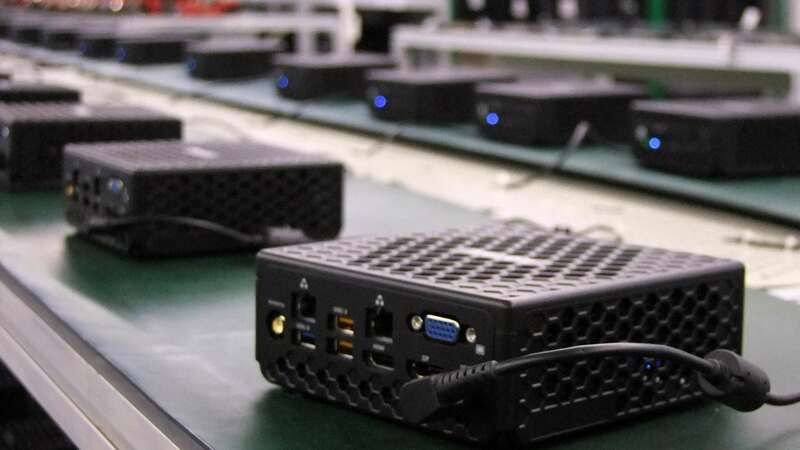 Production isn’t all that happens in the factory though, with all kinds of preparatory testing carried out before a line is ready to roll out thousands of the latest graphics card. But that’s why I came and why I found myself standing in a fetching blue anti-static coat and matching cap. The one part of the process PC Partner doesn’t do itself is the creation of the individual printed circuit boards (PCBs). 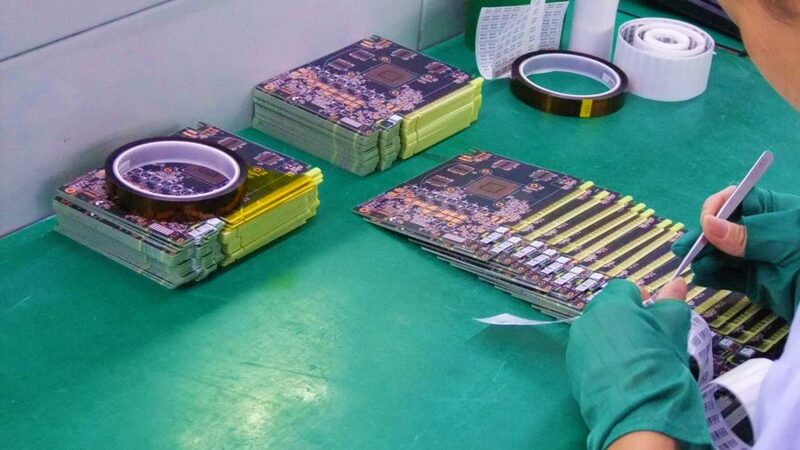 It has a design department which comes up with the final layouts, but the actual manufacturing is contracted out to other companies, with the bare boards arriving in bulk, ready for all the graphical goodness to be attached to them. Before anything is stuck onto them, however, each bare PCB is labelled and set into a frame which will hold either a pair of boards for longer PCBs or up to four of them for smaller designs. It’s more efficient than individual manufacturing and means no graphics card enters this world alone. The first part of the actual process is the screen printing of the solder. 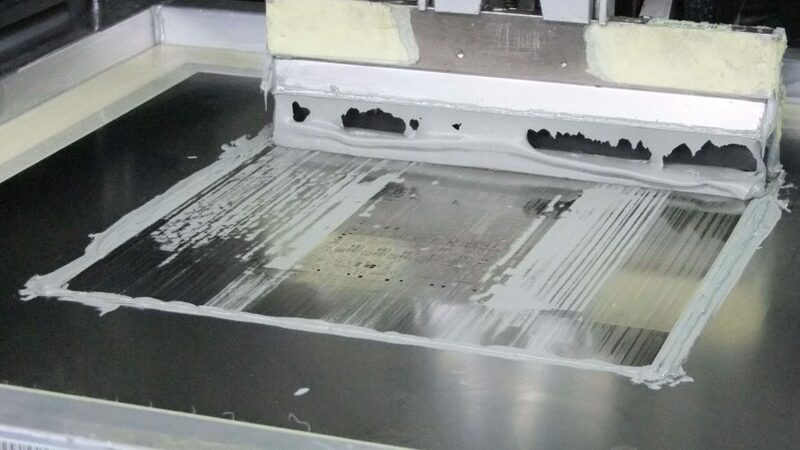 This thick goo is printed onto the myriad contact points of each bare PCB for the subsequent components to be attached to. Then my favourite machine ever starts its job. 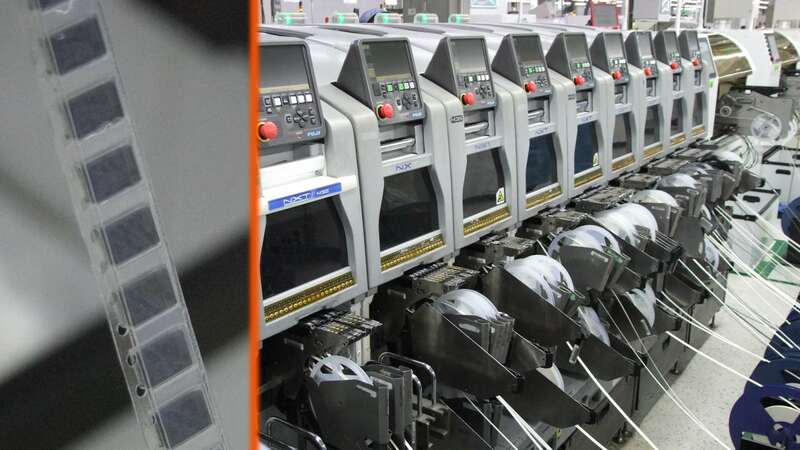 The pick and place machines are the precision workhorses of the process; their nimble fingers position the tiniest of components onto each board in a dizzying, hypnotic high-speed dance across the PCB. These machines are fed by reels of tape with all the individual components attached to them. A team of engineers at the start of each production line assemble the individual reels to whatever specifications are needed for that particular line. After all the smallest components are stuck to the board, the PCB then goes through a process called reflow soldering, which finally bakes the unit to ensure they’re all attached firmly. Once the boards have cooled they are then passed through an automatic optical inspection (AOI) machine to 100% guarantee that each miniscule component is in the correct position. If they pass, the PCBs are then flipped over so they can go through the same process again for the other side of the board. This is when the magical moment where the actual GPU gets dropped in happens; the moment when it stops just being a plain ol’ bit of printed circuit board with a few resistors and memory chips on it and becomes a fully fledged graphics processing monster. For me, this is when these graphics cards truly come alive. But the process is still not over. The larger components now need to be attached – the capacitors, power connections and video ports – and this is also where human beings really need to get involved. Many of these components are attached by hand, instead of the pick and place machines, before being passed through the wave soldering machines; devices with bubbling lakes of molten solder where the boards are passed across them to finally secure each manually inserted component. They are all then visually inspected before each board is put through a PCB cleaning machine which uses a PH neutral cleaning agent to ensure they’re 100% clear of any solder flux residue. This used to be one of the nastiest parts of the process, requiring seriously toxic chemicals to clean the boards effectively, but environmental concerns are starting to filter into such manufacturing. Finally the GPU cooler can be attached and the final cards roll off the production line… straight into testing. Every single graphics card that comes off the PC Partner’s production lines goes through a rigorous GPU testing process that lasts a full half hour. This is the most familiar part of the factory to me, with open test beds for slotting the cards into and different testing software stressing the parts to their limits. It even uses some of the same testing software I do in the office, such as the tessellation-heavy Heaven 4.0 test. Whether it’s at the automatic optical inspection, visual inspection or GPU testing stages, if a card fails for any reason it is then sent straight into troubleshooting where the error is located. From here each failed card will be repaired and dropped straight back into the production line. There’s little wastage and certainly no sad-looking bins of b0rked graphics cards cluttering up the facility. Finally the cards are packed up with their cables, adapters and (probably never-used) driver CDs before shipping out to the wider world to find their way into your gaming rig. 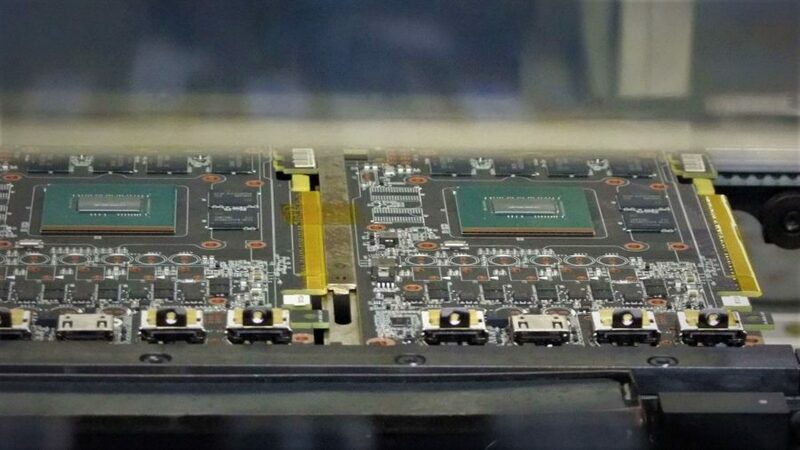 Those are the straight mechanics of the manufacturing process each of our graphics cards goes through, but there is so much more that happens even before the final production lines can roar into life. 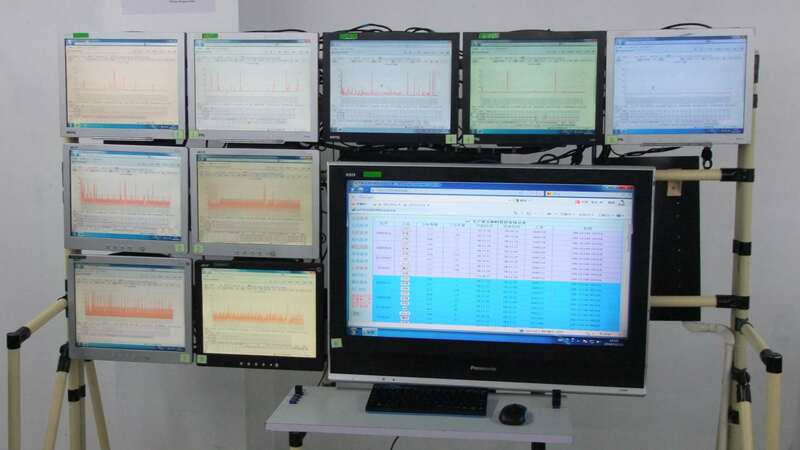 PC Partner also houses electromagnetic compatibility, thermal and acoustic testing facilities at its Dongguan site, allowing it to check every nuance of a given product’s operational tolerances before it commits to full manufacturing on an expensive production line. 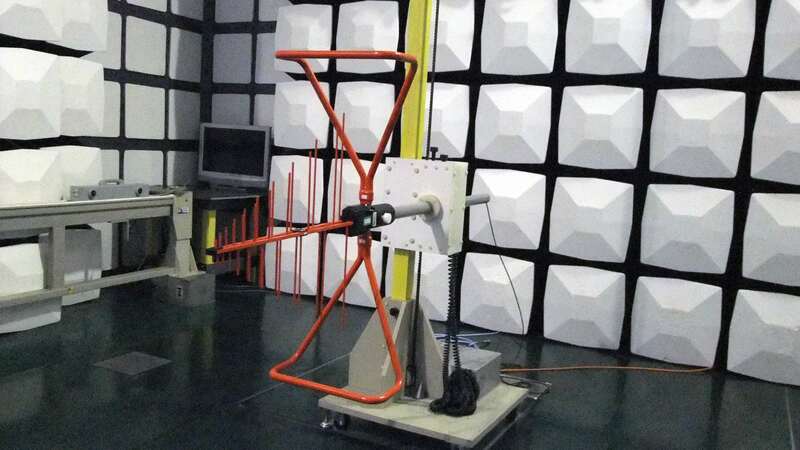 The $1.5m EMC lab is like something dragged straight out of Half Life’s test chamberrr. They’re waiting for you, Gordon… It’s a sealed room where devices can be tested in complete isolation to make sure they fully comply with all electromagnetic regulations. It’s also here they test the electrical stability of their products; deliberately electrocuting PCs and components to measure how well they can take it. I fear these will eventually become exhibits of mankind’s enduring cruelty to machines when our robotic overlords finally take over. Though the EMC lab will likely be less of an issue than the thermal torture chambers I witnessed inside the PC Partner factory. There are a host of different machines pushing tech to its limits, including thermal shock testers with extremes of temperatures at both ends of the thermometer, long-term, high-temperature stress tests and environmental temperature testing just to really put the boot in. But the really scary one is the five years accelerated life test. It runs for 144 hours at a temperature of 85°C and at 85% humidity in order to simulate a five year lifespan of a graphics card. It’s all worked out using a complex algorithm and allows the company to gather data on how a given card will fare down the line. Some of the companies it manufactures for will even want info on the 10 lifespan, but we weren’t allowed to see that machine, saving us from witnessing first-hand the sheer psychological and physiological torment the poor hardware inside must endure. 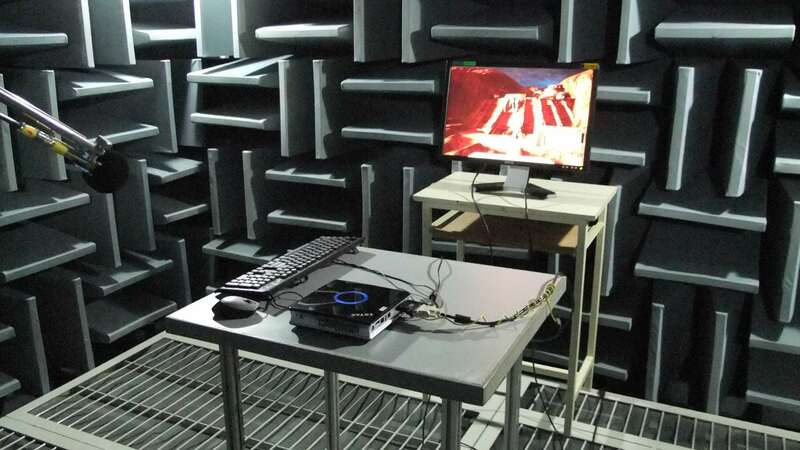 PC Partner also has an anechoic chamber in which to carry out acoustic testing on both graphics cards and mini PCs. With an incredibly low background noise level of just 12-13dB it allows the company to measure the vibration noise created by the various fans and coolers manufactured devices use. And it’s a seriously freaky place to spend any time. 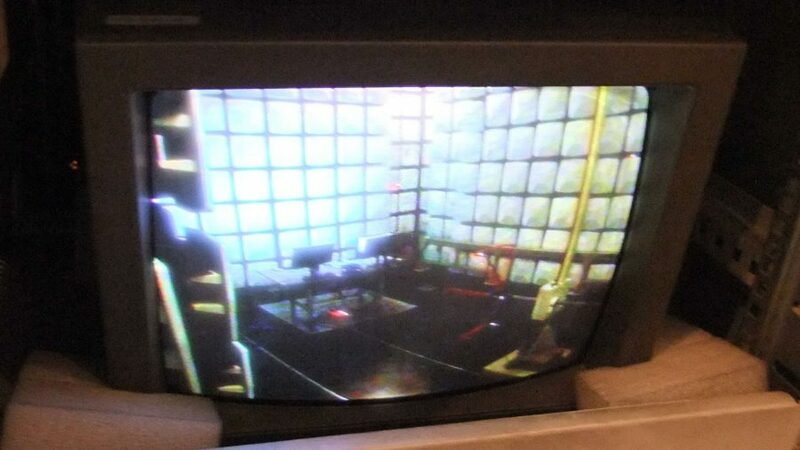 Anechoic chambers absorb all reflected sound waves, cutting noise off sharply. You might think the extra quiet would be quite relaxing, but the complete change in aural experience is seriously jarring. It’s all too easy to ignore the immense work that goes into the incredibly complex gear we have in the PCs we use just for larks. And it’s not just the component picking robots that go through it all either – each and every graphics card you’ve ever plugged into your rig has been built by many different pairs of hands. So, your humble graphics card has already been through quite a lot before it even gets into the dusty confines of your PC. Next time it throws a bit of a wobbly when you’re playing Hitman or CoD maybe give it a bit of a break, eh?